It was just small plants, so I am waiting on it to sprout and grow. Pickerelweed is a North American native, monocotyledonous aquatic plant. This plant grows in a variety of wetlands in a vast range from eastern Canada south to Argentina. They become in rivers and the Everglades. This plant is an emergent plant that is usually in flooded areas, so it is dependent on aerenchyma in the stem to carry oxygen to the roots. It is found in areas where the water level fluctuates. The Pickerel Weed Plant is pleasing to look at and provides a pop of color to any garden area! 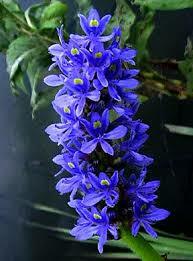 This large plant has small spikes of deep blue flowers and long, heart-shaped leaves. It stands about three feet tall with the flower spikes being about 6 inches. It will thrive and become a lush plant with many blooming flowers very quickly. The only requirement they have is that they do not dry out. Just water and your garden will be popping with color! This flowering plant multiplies very quickly; you can separate plants to keep it from growing too large. 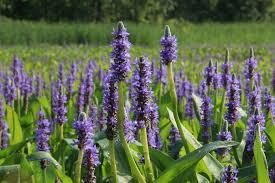 The Pickerel Weed Plant provides nectar for bees and butterflies. Pickerelweeds also contains a seed that is edible! It can be eaten straight off the plant, or mixed in granola, bars, and many other recipes! The young leaves are also edible and are tasty in a fresh salad. This facility is not only very pleasing to the eye, but it also adds healthy seeds and greens to your diet. With its large blue flowers and the way it attracts colorful butterflies, it creates an environment that is very pleasing to the eye! Pickerelweed is a winter aquatic plant that flowers best in muddy shallow ponds with full sunlight; these plants can also grow in tubs or containers that mimic the muddy ponds. Their hardy planting zones are 3-10 for the USDA. These plants grow between 2 to 4 ft tall. Due to the plant's ability to thrive in ponds and swamps, they become best in locations like Texas, Florida and all the way to the south of Canadian province Nova Scotia. 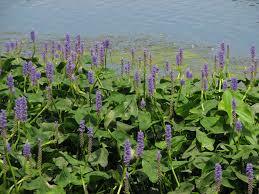 The Pickerel-weed is a sizeable aquatic plant with broad green leaves and beautiful tubular shaped pastel blue flowers with small edible seeds. The flowers grow from a long 3 to 6-inch stem. Pickerelweeds take about five months to develop from June to October.